FIBERGLASS VS. STEEL—WHICH IS BEST FOR MY TORONTO HOME? Brock Doors & Windows Ltd. FIBERGLASS VS. STEEL—WHICH IS BEST FOR MY TORONTO HOME? Your entrance is the heart of the exterior of your home, no doubt. Subsequently, the entry door is the focal point for onlookers, guests, and neighbors. In fact, everyone looks to the entrance for the entry door upon arrival/approach to your home because it is the passageway from the outside world into safety, comfortable air, and familiarity. Functions as the first-line safety defense against unwanted guests, break-ins/thieves, and intruders. Supplements the aesthetic appeal of your home based on its look and quality. Supports the overall style/look of the home (cottage, modern, antique, etc.). Raises the value of your home (especially in the case of unique customizations, added security, etc.). Here in Toronto, ON, there is a growing interest and popularity in steel and fiberglass doors—and our team at Brock Doors & Windows wants to help you sift through their difference to decide which is best for your home! Fiberglass is an especially great option for those who prefer a wood look (but would rather do without the additional maintenance). It is modern and efficient and you have your choice between a smooth and wood-grain finish (depending on your preference). More often than not, the stained, wood-grain finish is mistaken for a real wood door! No chance of rot, rust, or decay (as it’s made of a glass and plastic fibers embedded in a resin “matrix”). Resistant to extreme heat and weather changes. Available in countless styles and glass options. Works well for homes ranging across a large spectrum: traditional/old fashioned to cutting-edge/modern. Steel doors are also a solid, beautiful option for your Toronto home. They are extremely durable and customizable. Because of their smooth finish, they can be painted to evolve with your home over the years. Resistant to rust, rot, cracking, and bowing. Some come in fire-resistant, bulletproof, and chemical resistant varieties. Require replacement less often than most other options. STRONG; this material withstands an attack or a serious storm far better than many other materials. Choosing the right entry door—one that is inviting, aesthetically pleasing, and secure is actually much easier than you may think! 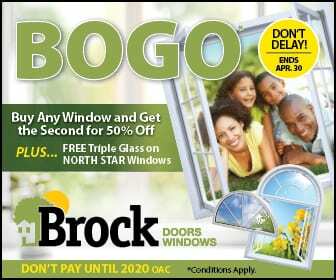 Here at Brock Doors & Windows, we sell and install only the highest of quality doors and windows. Are you looking for a new look and added security for your home? Give our team a call—we would be so thrilled to work with you!